Before I came to study at City, I was studying A-Level Mathematics, Chemistry and Economics. Before applying to City, I had already visited the University on numerous occasions, for example on an Open Day and a Taster day. I enjoyed my time at City and found the university atmosphere very welcoming. When it came to choosing which university to go to, I knew City would be one of my main options. I love meeting new people from different backgrounds. With City’s diverse environment I can meet students from all over the world regularly. The range of different societies is also great as you can always meet people you have things in common with, whether that be hobbies, culture or faith. 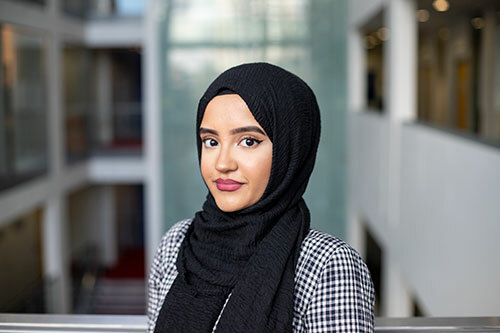 I am involved in being a Marketing Student Ambassador, which allows me to gain some experience whilst studying full-time. Being a Student Ambassador is a great job to include on your CV and it is something that employers value. I plan to pursue a career in finance or education. Luckily, my degree is very broad, so I am not limited to certain career options. I believe the transferable skills I have gained through studying at City are skills that I can utilise in any profession. What would be your top tip for our applicant? Research as much as you can about the different degrees universities have to offer, as well as specific modules in each course. Try to find a degree that you would thoroughly enjoy and would be able to manage the work load alongside other commitments.